Thirsty Pilgrim: Lock Up the Spice Cabinet, Throw Away the Key. Du Bocq's beers generally run spicier and sweeter than I like, but the brewery obviously has its fans. 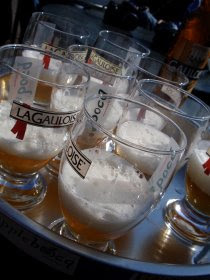 Most interesting factoid: Each of Du Bocq's beers – from Saison Regal to Gauloise to Triple Moine and more – is brewed with four spices, according to our guide. All four – coriander, ginger, orange peel and anise – go into ALL of Du Bocq's beers, she said. I asked for clarification because I thought that must be a mistake. It seems the presence of those four spices never varies, although the amounts vary depending on the beer. We can guess that the Gauloise Brune, for example, may have very little orange peel while the Blanche de Namur has very little anise, for example. Anyway, the highlight was the prolonged, post-tour tasting in the brewery's courtyard. We were lucky to get a warm sunny day. It was still beer and a damned enjoyable morning. And afterward I think I appreciate the little guys just a little bit more.